The question might be “What NOT to wear to an interview, rather than “What to wear to an interview”? I have seen people arrive for interviews with the most interesting outfits. They are drawing attention to themselves, however, it is not in a flattering way. Midriffs, cutouts, holey and/or dirty clothes and t-shirts with arm holes that show skin down to the belly button, are not appropriate attire for an interview. Even if the temperature outside is 80 degrees. Resist the urge to “under dress”. Some companies are more casual than others, so you may not have to wear a suit, but you still want to make a great first impression. Appropriate clothing is just as important as good hygiene. If the position is less formal, such as in manufacturing, jeans may be acceptable. They should be neat, clean and free of rips and tears. Shirts should be the same. Keep accessories to a minimum and pay attention to hygiene. Dress to impress. Sit up straight and speak clearly. Avoid slang. Smile! Remember – the person that is interviewing you needs to see you as an asset to the company. For more suggestions, check out the web. There are numerous articles devoted to this very subject. Good Luck! For women, a suit is not always necessary. 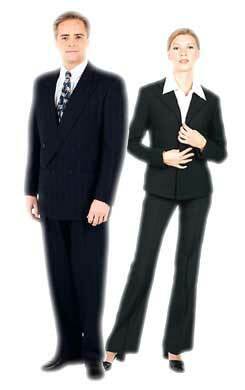 Professional dress pants and blouse with a blazer will work also. Men should wear a suit and tie for job interviews, or certainly dress slacks, dress shirt, tie and sport coat, if they do not have a suit. I agree always err on the side of caution. I remember reading you should always dress in the nicest outfit appropriate to the position. I think this is good advice, though I must admit I have never once worn a suit to a job interview nor do I even own one! You want to look professional, but also make sure you are wearing something that you are comfortable in so it doesn’t add to any nerves you might have about the interview. You want to feel like yourself! Some people might read this article and think, well DUH! But you would be surprised by what some people show up in when I interview them! Now mind you, the company I work for is very laidback and the dress code is casual, but we still are expected to dress neat and appropriately – but some people show up in ripped jeans, wrinkled t-shirts, etc. Atleast break out the iron before you get dressed! Nice black dress pants, a muted dress shirt and comfortable, but professional shoes. You don’t want to toss on big, high shoes and wind up falling or unable to walk when they take you down the hall to the interview room!! Another thing to remember – iron, carry a lint brush, make sure everything is prepped the night before. Your suit won’t look good if it is all wrinkled! Make sure that the outfit you wear allows you to exude confidence and quell any nerves you might have. You want your outfit to be professional and appropriate, but be sure that the attire you wear also makes you feel good and ready to walk through that door. Don’t forget a firm handshake too! Guys have to wear a suit. You can’t go wrong with it. It makes a good impression. I have a couple dresses that are easy to dress up or down depending on the company. I stick with classic and simple and I usually don’t try to get too crazy with accessories. I am of the mindset that you should dress like that everyday for work. It surprises me when I see people coming in wearing inappropriate graphic tees or sweatpants. Thanks to Sadie for the idea to carry a lint brush and to get the outfit ready the night before the interview. You don’t want to show up with dandruff on your jacket or a button missing. I think it’s important to dress for the position you want, but also keep a sense of individuality. They’re hiring you, not your clothes. Even if the job is more casual, I still wouldn’t wear jeans for the interview. You still want to show you are taking the job seriously. You might not need a full suit, but I’d still dress a bit more proper than you might have to for the actual job. I have been on interviews where the competition has been dressed completely inappropriately, and it has always surprised me. There is so much information available on the internet regarding everything to do with looking for and securing a job, that I find it hard to believe people have not figured out how to dress appropriately before arriving for their interview! My advice is to buy a few mix & match pieces way ahead of time and wear them a few times. That way you won’t be nervous about dressing up in brand new clothes for the interview. And polish your shoes the night before! If you’re careless about your appearance, you might give the impression that you’d be careless about details on the job. There was just a short mention of good hygiene. Believe me, no matter how well you dress you must always be clean and well groomed as well. And please, men & women, don’t put on a suffocating amount of perfume or cologne. You may love it, but some people may have allergies. I find that it is extremely important to be neat and well pressed regardless of the type of position you are applying for. What you wear can really set the tone and your confidence going in. You should have your outfit ready and decided the night before so you aren’t rushed or adding more nervousness. I don’t overthink it. I stick to black pants and a nice and simple blouse or a black dress. I made a mistake of going on an interview when I was younger wearing brand new shoes. I could hardly walk by the time I got there because it was in the city and I didn’t take flats to wear for the commute. I had blisters before it even started. Make sure to think about comfort!! This list went from what to wear to what to do. The end tips were helpful, but I would have liked if there was more focus on various work environments. It’s hard to figure out what to wear to an interview within an industry you’ve never worked in! I would say both outfits in the photo are 100% appropriate. Best to be overdressed than under. No one will fault you for looking TOO professional! I am not particularly comfortable in dresses. I usually wear a pair of black dress pants with a button down shirt or something equally formal. Minimal jewelry and accessories too and make sure to not go crazy with the perfume when you are going to be in a tiny room with someone!! I interviewed a woman with these overly long nails that were coated in neon and glitter. I got so distracted by the,! You should really always opt to err on the side of caution. You are better off looking TOO put together than not. Before any job interview, I make a point of picking out my outfit, ironing, making sure it is spotless. You only have one chance at a first impression and your wardrobe is part of that. I think that both photos at the top are acceptable. Can;t go wrong there! I actually like to dress up for work everyday. I don’t think it should be just for when you interview. Keep it up when you get the job and stay presentable! I am going on an interview Friday afternoon. This was a very helpful read. I have been agonizing over my outfit and even went out and bought a ton of new clothes and still don’t know what to go with.